Late comedian Bob Monkhouse is to feature in television advertisements about the disease which killed him as part of a prostate awareness campaign. 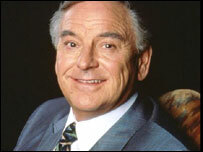 Computer wizardry was used to show a warning by Monkhouse in Prostate Cancer Research's Give A Few Bob campaign. His widow Jackie told the Sun newspaper it was a "great honour" for her husband, who died in 2003, aged 75. Meanwhile, 24 men "lay prostrate" in London's rush hour to show how many die of the disease each day in the UK. The campaigns coincide with the 10th Everyman Male Cancer Awareness month. In the television campaign, ad-makers blended archive footage of Monkhouse with shots of a body double in a graveyard in Surrey. The script, spoken by a sound-alike, warns: "What killed me kills one man per hour in Britain. "That's even more than my wife's cooking. Let's face it, as a comedian, I died many deaths. Prostate cancer, I don't recommend." His widow Jackie, 70, told the Sun: "Bob would love this ad. It's funny but has a serious message about the threat of prostate cancer." The campaign aims to raise donations for research into the disease. In London, prostate cancer patients were be among those taking part in the events in Leicester Square and the South Bank as part of the Everyman campaign. The campaign, by the Institute of Cancer Research, aims to raise awareness and fund research into testicular and prostate cancer at The Everyman Centre. The institute said it was Europe's first and only centre dedicated to male cancer research. It said prostate cancer affected around 32,000 men a year in the UK and had overtaken lung cancer to become the most common cancer in men. However, research into the disease was "10 years behind many other cancers", the institute added.